This is an old movie from the 80s. I probably first watched it 20 years ago. It holds up surprisingly well. On the surface it’s just your typical slapstick road movie with all kinds of chaos and bad things happening, but deep down it’s got some heart. It is serious without being serious and fun without being too stupid. I actually was very impressed by John Candy’s performance. He plays a buffoon, but with sincerity. It’s really quite remarkable. Steve Martin is always good. A great classic flick. This is a movie about the true story of MIT students who formed in a card counting club to gamble at blackjack in Vegas. They were led by their professor and the movie is the story of one young man who is trying to pay for his Harvard Medical tuition. Of course he gets greedy and wants more than the money he actually needs, and that leads to all sorts of trouble. The story is somewhat predictable, but it works. We like the main character and root for him to succeed. There isn’t really a whole lot of story here — it’s mostly the thrill of the high lifestyle of Las Vegas. But it’s fun and interesting, the performances are good, and the ending is typical Hollywood. I liked it. : The Books Are Here! 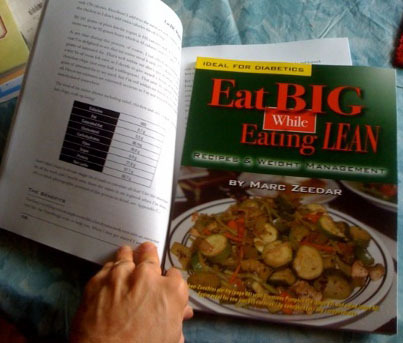 Today the shipment of my new book, Eat Big While Eating Lean, arrived! That means I can start fulfilling early orders and new orders will be sent out quickly. Check out the book and let me know what you think! I had never read the original story, so I didn’t know what to expect, but I think I like the original story better than the movie. There are places where the movie has obvious Hollywood-isms. When the movie sticks to the original story (the places where narration is used), the movie works very well. But often the movie add silly comic sidebars that don’t work. But overall it’s still a rather harmless, entertaining movie. Kids seem to like it, but I’m not sure adults will get much out of it. The story is surprisingly mature for kids, in the sense that it’s about tiny creatures that live on a speck on a flower that an elephant is trying to protect. But the story’s theme is that all people, no matter how small, are important — and that’s a good lesson for kids. This is the book the movie was based on; I listened to the audiobook edition while traveling. It’s very different: the people are vampires, not mutants, and the story is hardly even similar, though there are occasional overlaps. For instance, a dog does die in the book, but it’s not the man’s only friend like in the movie, and the woman he meets has a different role and no kid. In some ways I prefer the movie version as the vampire thing seems sort of cheesy and unrealistic. (A plague that causes vampirism? Please.) But the book’s interesting and less gimmicky in plot than the movie. The conference is over — it was great. Lots of neat people (really, really smart people), some great sessions that will make me a better programmer, and some fantastic new products. I cannot tell you how excited I am about Yuma. It’s a PHP replacement built using REALbasic as the language: not only does that make it much easier to program than PHP, but I can reuse existing code to easily turn my RB projects into web apps! Wow. In other news, the new Association of REALbasic Professonals was formed and I have the honor of being elected as one of the five board members. I guess someone thinks I’m capable of something! It’s now Saturday morning and in an hour I leave for the airport and my flight home. I sure hope it’s uneventful. I’ve had enough travel adventures this time to last me for a long, long time. Yesterday I got up at 4 a.m. to get ready for my flight to Texas. The news showed a picture of the U.S. with Oregon/Washington and Texas covered with rain clouds. “Great,” I thought. “The two places where I’ll be today.” Well, not so fast. After 90 minutes on the airplane, they kicked us off saying they had canceled the flight: tornadoes in Texas had shut down the Dallas airport. I was now in a queue of hundreds of others trying to make alternative arrangements. American Airlines had no other flights, but after 90 minutes on the phone, I’d managed to get booked on an overnight Delta flight to Atlanta with a connection to Austin (my destination). The Delta flight was leaving San Francisco at 10 p.m. so I flew down there (having to go through Portland security a second time, this time getting a special “extended check”) and arrived at 8 p.m. After waiting in the Delta queue, I was told they had my reservation, but needed an actual ticket voucher from American — so I had to walk 10 minutes to the American queue (two terminals away). When I finally got to a rep there, they gave me a ticket and I went all the way back to Delta, only to have them tell that despite my confirmed reservation, the flight was overbooked my 18 people and there was no way I was getting on that flight. Delta blamed American, American blamed Delta. What a mess! I had to go all the way back to the American desk, only to find it now swamped with people, where I had to wait in line for an hour to talk to someone. Nice. I’d only been waiting for American reps about four hours all day so far, why not longer? The American rep was nice but couldn’t do much: she couldn’t even comp me a hotel as supposedly my whole reason for the missed flight was “weather.” (I don’t agree: they flew me to San Francisco where I would need a hotel when I could have stayed at home for free.) I was booked on a 10 a.m. flight to Chicago today. I made reservations at a local hotel but the free shuttle never arrived. I’d also called a friend who lived nearby — he was going to meet me at my hotel but since the shuttle wasn’t there, he picked me up instead. After checking in to my room, we went out for a late dinner (it was eleven p.m. but he hadn’t eaten yet either). I went to bed at midnight quite exhausted. I arrived in Chicago at five with the anticipation of a four+ hour wait for my 9:30 flight. But looking at the board I saw there was a 5:45 flight to Austin so I wondered if I couldn’t be bumped up. I hurried to the gate where the flight was just starting to board. Unfortunately, the standby list for the flight had 40 people on it! I gave up that dream. (There were still 35 on standby for my flight. I overheard someone say it was because so many people were still trying to make up for missed connections due to the original weather delays and cancelations.) So, to end a long adventure, I arrived in Austin at nearly 1 a.m. (our departure from Chicago was delayed by 30 minutes the flight crew was late). I missed the whole first day of the conference, though it was kinda neat to be able to keep up with news from the conference via twitter and blog and forum posts with my iPhone. I don’t know why I’d never heard of or seen this film, but I liked it. It’s about a jaded advertising exec who (for not so nobel reasons) gives his free plane ticket (from his airline client) to a bumped passenger who then dies when the plane crashes. This event sparks a rethink for the ad exec who eventually meets up with the man’s widow and falls in love with her and her kids but doesn’t tell her he “killed” her husband. What’s going to happen when she finds out? It’s a little melodramatic, but mostly low-key and nice. Simple. I liked it. : The Book is (sort of) Here! The book looks fantastic — I am very impressed with the print-on-demand quality. I’ve gone ahead and ordered a bunch more and they should be here in a couple weeks (before the end of the month). You can go ahead and pre-order the book if you’d like: you’ll get the digital version immediately and I’ll ship the printed copy to you when I get them (end of March). As a reward for ordering early, you’ll get a free license to my upcoming nuTracker nutritional management software! I thought this was a standard bank caper/con job sort of film, but because it’s based on a real life story, it’s much different. Everything gets really convoluted, just like in real life. Let me see if I can explain the mess. Basically in 1971 the British government tried to prosecute a bad drunk dealer from Trinidad, but he apparently had taken compromising pictures of the royal princess — thus rendering him immune from prosecution as the govt. couldn’t afford to let him release the photos. But MI-6 learns the pictures are in a safety deposit box at a certain bank in London and since they can’t do anything official, they recruit a group of semi-criminal losers to rob the bank. The thieves think it’s just for the money and know nothing about the photos. Everything goes as planned, to an extent, but then the thieves discover that in the safe deposit boxes are a mobster’s account ledgers which incriminate a slew of cops on the take, as well as a madam’s compromising video and pictures of some of her high-profile government clients. Everyone wants their stuff back, of course, and suddenly the robbers are being chased by everyone: the cops, the mob, MI-6. It’s crazy! Despite such complexities in plot, the film works — it’s easy to understand what is going on and the complications and problems are hilarious. Excellent film. Not particularly deep, but definitely fun and well-done. Flashy special effects are at the heart of this film and though the story tries (too) hard to be “important” it’s way too generic and the “deep” aspects of the film just come across as silly. That said, it’s not that bad a film. The story is simple: a tribe is attacked and their people taken captive, including a girl who is the main character’s bride-to-be, so he sets out after them to rescue her. He has adventures along the way, there’s action and drama, bla bla bla, he makes friends who help him overthrow the evil emperor, horray for everyone. There’s a degree of “mystical” nonsense that plagues the film and that weakens the ending which goes a bit into weird territory with a death that makes no sense, but overall this is a fun film, the special effects are genuinely impressive and worth seeing just for them.